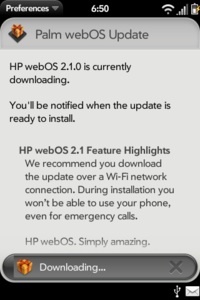 Looks like HP and Verizon have started pushing out the webOS 2.1 update for the Pre2 smartphone. Hit up the Update application to get your webOS 2.1 goodness. And yes, I'm still bitter that the Sprint Pre won't be getting webOS 2.1 either as an OTA or slide load Doctor update.